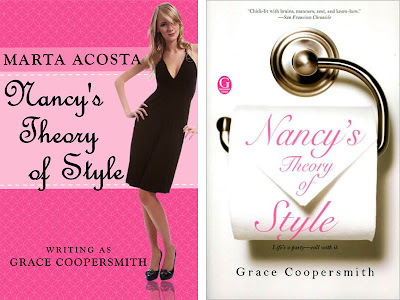 Nancy's Theory of Style written by Marta Acosta as Grace Coopersmith is a romcom that is a laugh-out-loud romp and highly recommended. And it even includes ninjas ! I read it this past summer while recuperating in the hospital and it was just the right feel good tonic. If you've liked the style and writing in Marta's Casa Dracula books you will definitely enjoy Nancy's Theory of Style. You can read the unedited draft of the book free on Scribd. On the left below is the cover Marta designed and on the right the publisher's. Which do you prefer? Lively, pretty young socialite Nancy Carrington-Chambers has always believed that an excellent sense of style and strict attention to detail are what it takes to achieve a perfectly chic life. Now, however, her own haute couture marriage is starting to resemble a clearance rack, as husband Todd manifests more and more symptoms of a dread disease—incurable tackiness. Seriously concerned, Nancy flees their vulgar McMansion for an apartment in San Francisco’s posh Pacific Heights. She’s determined to make her event planning company, Froth, a real winner, but her new prize assignment—reinventing the turgid Barbary Coast Historical Museum fundraiser—must be spectacular in every way. Luckily, Nancy now has the perfect assistant. Derek Cathcart is British, impeccably dressed, gorgeous, and clearly gay—so why does Nancy find him so attractive? Before Nancy can unravel her feelings for Derek, her irresponsible cousin Birdie abandons her four-year-old daughter at Nancy’s and takes off to parts unknown. Nancy, Derek, and little Eugenia make an unlikely “family,” but strangely it all seems incredibly right. Nancy’s parents are pressuring her to return to Todd, however, and she still has to pull off the party of the year. For someone who has always prided herself on knowing exactly where she is going, Nancy is sailing into dangerously uncharted waters. Irresistibly funny, romantic, and heartwarming, Nancy’s Theory of Style shows that happiness and love—just like fashion—have never been about playing it safe. I like Marta's cover. Sounds like a fun read! Dear Arch Nemesis, thank you for mentioning my free read. I'm sure you are only acting nice so that I will drop my guard and fall into some diabolical plot. I asked my designer to come up with a cover that would be eye-catching as a thumbnail. I'm surprised at how many publishers neglect to consider thumbnail size graphics when coming up with book covers, especially since so many people buy books online.